We’ve all heard horror stories about parents who accompany their adult children on job interviews or email college presidents over their child's roommate issues. But parental behavior doesn't have to be as extreme as this to qualify as "helicoptering." Experts who study parental control say it isn’t as easy as simply classifying an involved parent as a helicopter. Instead, the phrase is more about whether a parent does something for a child that is developmentally inappropriate. Whether it’s tying a second-grader's shoes or helping a college student with an essay, the bounds of appropriate parental behavior shift as the child grows. This type of involvement robs children of important lessons, argues Holly H. Schiffrin, an associate psychology professor at the University of Mary Washington in Virginia. When parents drop off forgotten lunches or homework assignments at school, she said, they shield their children from the consequences of forgetting these things -- such as having to use their own money to purchase food, or making up for a zero on an assignment. "If children aren’t allowed to experience the natural consequences of their actions when it’s relatively low stakes, then it’s hard for them to learn those lessons," said Schiffrin. "They repeat the same mistakes when it’s a higher stake situation." Research on so-called "helicopter parents" is still in its infancy, which is why estimates of such parents fall all over the place. A 2009 survey of about 9,000 college students found that 38 percent of freshmen and 29 percent of seniors say their parents have intervened to solve a problem for them “very often” or “sometimes.” A 2010 study of 300 college students estimated that only about 10 percent of them had helicopter parents. And while most assume the behavior is limited to middle- and upper-class parents, researchers at the University of Texas at Austin found that all income levels, genders and ethnicities are represented in the phenomenon. But even though the definitions of what it means to be a helicopter parent are still being established, scientists claim the effects of overprotective and neurotic parenting are becoming clear in the newest generation of adults. College counselors claim rates of severe psychological problems are rising among students and researchers say children are over-scheduled and stressed. Complicating matters is the reality that this newest generation of adults, millennials, truly are unusually close to their parents, perhaps because of the fact that there's less of a cultural gulf between boomers and their millennial children than, say, the traditional Silent Generation and their boomer children. Companies recognize this with events like “Bring Your Parent To Work Day.” And colleges are learning how to respectfully interact with intrusive parents. But surprisingly close parent-child relationships don't necessarily meet the qualifications of helicoptering, either. What's more, some individual factors commonly cited in the conversation to define helicoptering -- such as financial assistance -- ignore current economic realities, according to Larry Nelson, a professor of human development at Brigham Young University. Young adults who don’t get at least some financial support tend to have higher college dropout rates and lower starting salaries after graduation, he said. "Parents don’t always see themselves as helicopter parents because they think that they are trying to help their children and give them the best chance at success in life; they don’t see it as negative," Schiffrin said. "It’s hard to give parents specific guidelines except for following the child’s lead on how much support they need." There’s more at stake than just semantics. Schiffrin, who researches helicopter parenting, found in a 2013 online survey that college students with controlling parents are more likely to be depressed and less likely to be satisfied with their lives than those without controlling parents. These college students also reported lower levels of competency and autonomy, and Schiffrin hypothesizes that parental control and depression are linked. 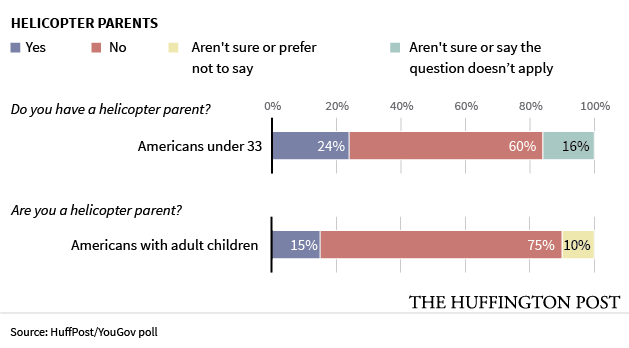 The HuffPost/YouGov poll found more evidence of a generational mismatch: Most millennials also think they talk to their parents just the right amount, thank you very much, while most parents wish they could talk to their no-good, ungrateful kids more. But words and deeds are two very different things. Despite the fact that millennials are just fine with the amount of time they talk to their parents, 25 percent of them think that it’s generally better for parents to stay closely involved in the lives of their adult children, as opposed to 21 percent of parents who think the same. 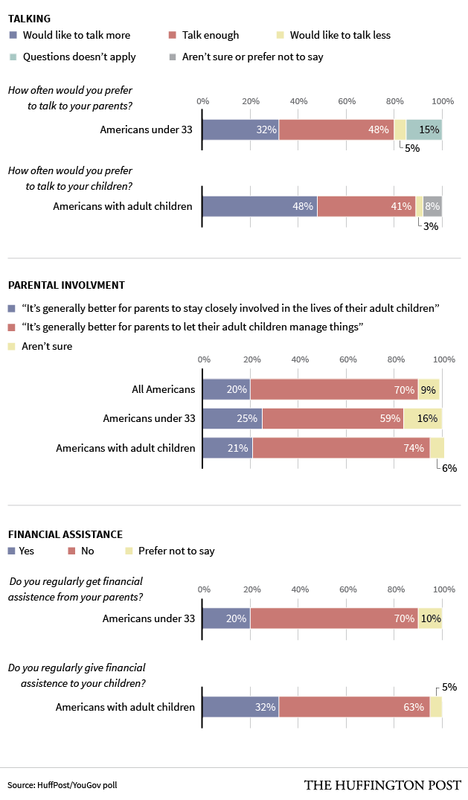 And while only 20 percent of millennials cop to financial assistance from their parents, 32 percent of parents with adult children (age unspecified) say they’re still supporting them financially in some way. Nelson doesn’t think helicopter parenting is that prevalent, or even that it’s the worst kind of controlling style parents may use to rein in their adult children. Behavioral control, in which parents may offer to bankroll a child’s college tuition on the condition that they get to choose the child’s major, for example, and psychological control, which involves guilting, ignoring or manipulating the child’s thoughts and feelings, are more common and more destructive, he said. Rather than objecting to all spending on children, he believes that parents who can help financially should -- but only up to a certain point. "Our own work shows that the problem is when parents pay for all of their children’s needs AND wants,” he said. "In our study, the emerging adults with the worst outcomes were those whose parents paid for their housing, tuition, books, food, and entertainment (in other words, parents paid for 100 percent of their children’s lives)." A recently published review of 20 studies encompassing 20 million participants found that as adult children are returning to the family home in the face of economic or relationship setbacks, they tend to create additional household chores for their parents (i.e. they don't help out around home), and the financial strain prevents parents from retiring. Schiffrin also points out that if parents compare their situation to others, they may end up feeling bad about the amount of money they give to their kids. "There has been some research showing that parents' well-being is also adversely affected if they think that the amount of support they have to provide to their (adult) children is more than what most other parents have to give,” she wrote. To sum it up, you don’t have to barge into your adult child’s office interview to be a helicopter parent, but just because you provide some financial support to children, that doesn’t make you one, either. But the next time you find yourself tempted to intervene in a challenge your adult child should learn from on his own, Nelson advised, ask yourself if you’re doing it to truly help them, or if you’re just saving yourself the pain of watching them fail or embarrass you. The HuffPost/YouGov poll consisted of 1,000 completed interviews conducted Oct. 23-25 among U.S. adults, using a sample selected from YouGov's opt-in online panel to match the demographics and other characteristics of the adult U.S. population.